Civil Liberties Monitoring Committee strongly condemns the arrest of Mr. Khurram Parvez, a prominent human rights activist. 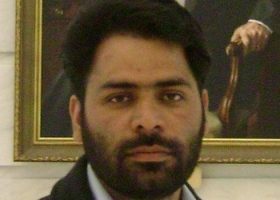 The arrest of Khurram Parvez reflects how the Indian fascist government is suppressing the Kashmiri people and defendants of human rights. Mr. Khurram Parvez is the Coordinator of Jammu Kashmir Coalition of Civil Societies (JKCCS) and Chairperson of Asian Federation Against Involuntary Disappearances (AFAD). He is very active in the human rights movement and is exposing the human rights and civil liberties violations by the Indian security forces. He was very actively updating the conditions in Kashmir and diverting the attention of the people of world towards the sufferings of Kashmiri people. His work is very much democratic and peaceful. But, the intolerance of the Indian government is too high that Indian government did not spare even the activist life of Khurram Parvez. In fact, the conditions in Jammu & Kashmir are not dealt politically and the right to self determination of Kashmiri people is denied since 70 years. Indian government is cheating the Kashmiri people, torturing and killing them to suppress the facts and demands. The Indian government does not have the guts to face the reality and by killing the people and deploying heavy military forces, it pretends as if it has buried the aspirations of the people. But the matter of the fact is that the aspirations of right to self determination and freedom is so deep rooted in the heart and minds of the Kashmiri people, that even after killing more than one lakh people by the Indian government, their desire for self determination has not vanished. Once upon a time Kashmir was popularly known as paradise on earth but now it has turned into a battle ground and the precious human lives are being destroyed. Since July 2016 every part of the J&K is under curfew and 80 persons have been killed, more than 11,000 have been injured, more than 1000 persons arrested and more than 100 ambulances have been attacked by the Indian security forces. The daily life is completely paralyzed in the region and it is a matter of concern that this reality is neither understood by the Kashmir government nor the Indian government. Civil Liberties Monitoring Committee draws the attention of the people of world that Article 9 of the Universal Declaration of Human Rights decrees that “No one shall be subjected to arbitrary arrest, detention or exile” which means, the government cannot deprive an individual of their liberty without proper due process of law. Worldwide the despotic regimes have used arbitrary preventive detention laws as a certified weapon to curb any kind of opposition or contrary opinion to their official propaganda. Under these circumstances, Civil Liberties Monitoring Committee demands the government of India to release Khurram Parvez immediately, stop the killing of Kashmiri people, respect the right to self determination of Kashmiri people, withdraw the military forces from Jammu & Kashmir and repeal Armed Forces Special Powers Act (AFSPA). Indian government should end the harsh and undemocratic attitude towards Kashmiri people and it should understand that by killing the people, their aspirations cannot be crushed.